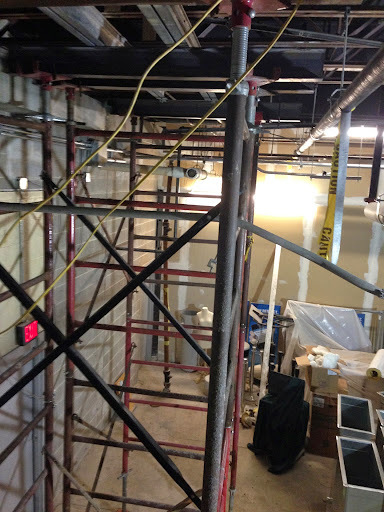 Not only was Superior Scaffold called in to provide shoring while new support columns were added – but then we had to shore up the bar joists and steel beams for 150 feet so crews could roll a 10,000 pound escalator into place on the floor above. Pretty darn cool! You can see to the left in this photo where crews cut a hole in the flooring for the new escalator. They were demoing a building and removing an old staircase. That staircase was being replaced with that escalator. This job was done in phases. 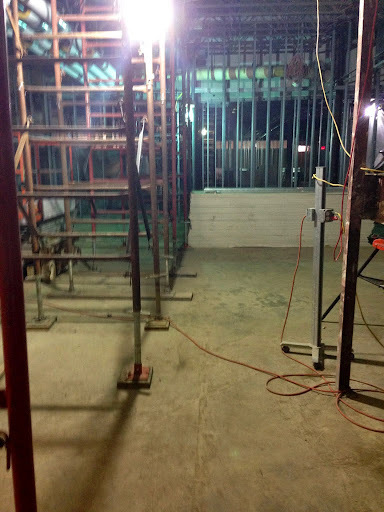 First step was adding new support columns so we needed to shore up the steel beams and bar joists in the basement level. 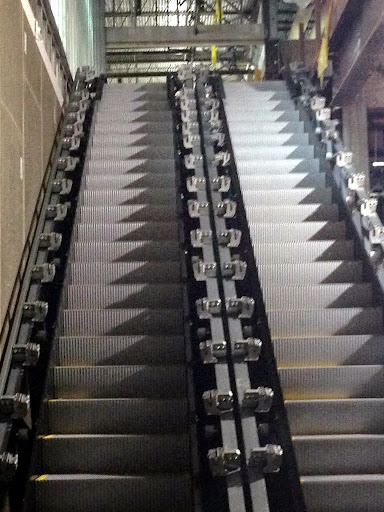 Then, we had to support the flooring for over 150 feet so crews could roll the 10,000 pound escalator into place. We had to make sure that the entire path of the escalator was shored up so the floor wouldn’t collapse under the weight. Then, crews dropped the monster escalator into place! We also provided a small canopy, overhead protection on the outside of the building as well. The escalator went in without a hitch and the rebuild is moving ahead. 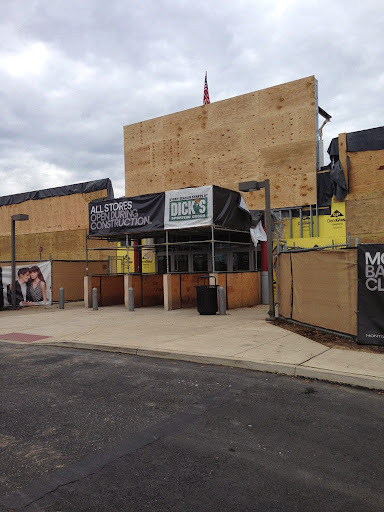 For information on the Montgomery Mall – click here. This entry was posted on Friday, October 17th, 2014 at 12:52 pm	and is filed under Uncategorized. You can follow any responses to this entry through the RSS 2.0 feed. Both comments and pings are currently closed.